In this tutorial, we will learn the different types of practical inheritance example program in Java with the explanation. You know that Instance variables are initialized at compile time. When the instance variable of the superclass is same as that of the child class instance variable name, the reference type play an important role to access the instance variable. Consider a below example program. 1. Line number 1: Inside the main() method, an object of class Q has been created. The reference variable q is pointing to the object of class Q. 2. Line number 2: Variable 'a' of Q is called because the reference variable of the class Q has been created and is pointing to the object of class Q. 3. Line number 3: The superclass reference variable is declared equal to the child class object. 4. Line number 4: 'a' of P is called because, in the main() method, the reference variable of class P has been created but the object is created for the child class whereas the object is referring itself to the superclass. As the object is referring to the superclass at compile time, the compiler checks that whether an instance variable is present or not. If the instance variable is present in the superclass, at runtime, it will call the instance variable of the superclass. (Remember this point). 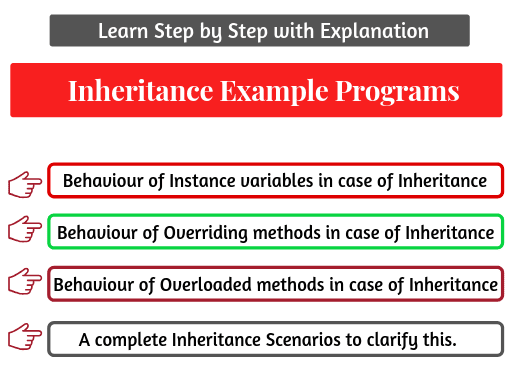 Let's take one simple example program to understand the behavior of overriding methods in case of inheritance. 1. Method overriding is only possible in the case of inheritance when the superclass method is overridden in its subclass. In the method overriding, method name, its argument type, the number of arguments, and return type must be the same. 2. Line number 2: The variable 'x' of the child class is called because the object is created for the child class. The reference variable obj is pointing to the object of the child class. 3. Line number 3: Here, msg() method of the child class is called because when any overridden method is called, it completely depends on the object through which it is called and the appropriate method call takes place according to this object. Since the object has been created for the child class, So msg() method of the child class will be called not of a parent class. 4. Line number 5: Here, Baseclass obj1=new Childclass() implies that the superclass reference variable is declared equal to the child class object. In other words, the superclass reference variable holds the address of the created subclass. The reference variable 'obj1' is eligible to call only the members of a superclass. 5. Line number 8: msg() method of Childclass is called. This is because the object is created for the child class. Let's take another program related to this. a. When an object of class Hi is created, It calls the constructor of class Hi. But, the class Hi has got Hello as its parent class, the constructor of class Hello will be called first. Since the instance block is present in the parent class, it will be executed first before the parent class constructor and calls the show() method. The show() method is overridden in the child class and the object is created for the child class. Therefore, the output will be "Hi method". b. After executing the instance block, the constructor of the parent class will be executed. The output will be "Hello constructor". c. Inside the parent class constructor, The overridden show() method will be called. So, the output is "Hi method" because the object is created for the child class Hi. d. After executing parent class constructor, the constructor of Hi (child class) will be called. 2. Line number 2: The show() method of class Hi is called because the object is created for the child class. 3. The output will be the same for line number 3 and 4. Method overloading is done at the compile time. Therefore, an appropriate method is invoked according to the reference type to call an overloaded method. Let's see a simple example program to clarify this. 1. Line number 1 implies that 'a' is the reference of the parent class whereas an object is created for the child class. When line number 2 is executed, food() method is called through the reference type 'a' then at a compile time, the compiler checks the food() signature in the parent class. If the food() method is not overridden, at runtime it will call the parent class method. That's why the output is "What kind of food do lions eat?". 2. When line number 3 is executed, it will give compile time error. This is because the parent class Animal does not have a food method that takes an integer argument. 1. At a compile time, an object reference variable plays an important role to call the method. 2. At runtime, the type of object created plays an important role to call the method. Now consider the below scenarios. Program source code 4: This program creates a superclass called AA and one subclass of it, called BB. Superclass AA declares two variables x, y, and two methods called msg1(), and msg2(). The subclass overrides one variable y and one method msg2() declared in AA. It also declares one variable z and one method called msg3(). Only change below class for all type of below scenarios. Scenario 1: In this scenario, there is a class Scenario1. Inside the main() method, an object of class AA is created and calls the variables and methods by using the object reference variable. Hope that this article has covered the different types of practical inheritance example programs in Java with the explanation. All the programs are very important for the beginners and freshers. Keep in mind all the above concepts.